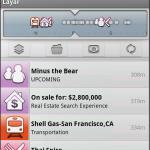 Yesterday was a very significant day for the AR world, as Layar released their 3.5 release with a new functionality called Stream. While this can be viewed as a UI change and yet another way of presenting AR information, this is in fact a huge step in the direction of AR as a first class medium. In that sense this is no less significant than the first consumer version of the web browser was (say Mosaic 1.03 or Netscape 0.9 so you will). Within the Layar platform, a single AR browser for multiple platforms and targeted at the global market was already a fact. But each AR content item (the Point of Interest, POI in short) was still confined to it’s defining layer, which is of course the under control of one publisher per individual layer. So even if a publisher would want to publish the richest possible AR content for a domain, they would be limited by the availability of accurate AR content to them. For a example (and this is real): there might be several branches of banks who publish their own, branded version of a “ATM finder” layer. They might not have accurate data about all available ATM’s or leave the competing branches out because of better brand recognition. Which is inevitable or even fine as a business decision. For the end user, who just wants to find the nearest ATM, this is very awkward; they have to first find all available ATM finder layers ad then open them, one by one. In Stream everything is combined and accessible by just the single search term “ATM”. Now don’t get me wrong, I do recognize the importance of having the Single Layer concept for branding, ownership and even paid business models. Even more, this is one of the enablers four our business model behind TAB worldmedia. Even more, it benefits the end user as well, as this is a way to communicate the source and thus trustworthyness for specific content. I do trust the branch owner of a certain ATM brand more than just a generic publisher regarding location and availability. 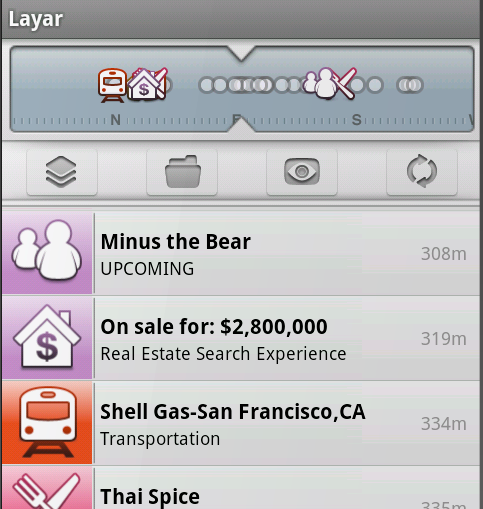 So this is where Layar steps in and created a really smart compromise. Stream combines the best of two worlds in a very elegant way: it makes the most relevant AR content available to the end user, while still providing context and branding when a user “dives in” and opens the POI, as this is still displayed in its own context and branded layer. The whole stream approach is exciting for yet another reason: it means that we have a significant and diverse offering of AR content in many regions already, which justifies a unified and categorized or searchable, well, stream of AR data. In other words, there’s so much content out there that a simple Layer catalog approach is not sufficient any more for discovery. And thus, it signifies the emancipation of AR as a first class content medium, as stated above. I’m really excited to see this happen within a year after the launch of the first open AR browsers, yet another signal about the high pace at which AR is evolving right now! Read the original announcement here: Layar revolutionizes Mobile Content Discovery with new Stream Technology powered browser. Note: Layar Stream is available for Android right now from the Android Market, iPhone users have to wait a little as the approval process needs to be completed before they can update their version through the AppStore. @ivo honestly, the move from AR app (current layer model) to first class AR object AKA a POI enables such a wide range of new possibilities… just think of indexing, search, discovery, filtering and opening up the ecosystem in general! No less significant then the first consumer browser? It would be pretty exciting if it had the same significance! It’s a nice development. While were making analogies to web browsing we still need to solve; searching, filtering, syndication, rich media, development tools, etc.